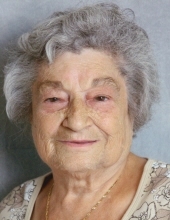 Peoria-Cecilia P. Maroon, age 99, of Peoria, passed away on Tuesday, January 22, 2019 surrounded by her loving family. Cecilia was born on December 20, 1919 in Peoria, a daughter of Michael and Kemla (Farrah) Couri. She married Raymond P. Maroon, Sr. on February 11, 1947 at St. Patrick’s Church in Peoria. He preceded her in death on March 12, 1993 in Peoria. She was also proceeded in death by her parents, one son, David M. Maroon, Sr., her great granddaughter, Sophia Donald, her great grandson, Andrew Nelson, along with 6 brothers and 3 sisters. Surviving are eight daughters; Elaine Donald, Dodie (John) Burns, Kathie (Jim) Meagher, Milly (Justin) Howeler, Peggy (Bob) Barnes all of Peoria, Maureen (Chris) Nelson of St. Peter’s, MO, Mary Beth (Tony) Couri of Decatur, Linda (Pete) Argo of Washington and one son Raymond P. (Marla) Maroon, Jr. of Peoria. Also surviving are 39 grandchildren, 52 great grandchildren and 2 great-great grandchildren, one brother Michael (Margie) Couri of East Peoria and several nieces and nephews. Cecilia was a member of St. Philomena Catholic Church and was the oldest member of the Ladies Itoo Society where she served the club faithfully. A funeral Mass will be held on Saturday, January 26, 2019 at 10:00 am at St. Philomena Catholic Church. Fr. David Richardson will officiate. A visitation will be from 4 to 8 p.m. Friday, January 25, 2019, also at the Church. An additional visitation will be held one hour prior to the Mass at the church. Burial will be in St. Joseph Cemetery in West Peoria. In lieu of flowers, memorials in Cecilia’s name, may be made to the Itoo Society, Sophia’s Kitchen Angels Among Us, or St. Sarkis and Bakhos. To send flowers or a remembrance gift to the family of Cecilia P. Maroon, please visit our Tribute Store. "Email Address" would like to share the life celebration of Cecilia P. Maroon. Click on the "link" to go to share a favorite memory or leave a condolence message for the family.